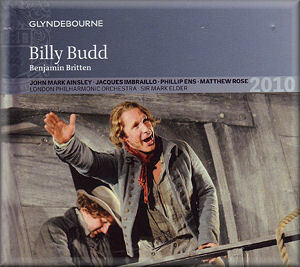 In these days, when an opera written other than to a specific commission may have to wait years for a first performance, it is amazing to realise that Billy Budd – originally destined for the Edinburgh Festival – was first staged at Covent Garden within a month of the completion of the full score. Under the circumstances, and given the clearly limited amount of time available for rehearsal, it is also amazing that the performance - which can be heard on a pirate issue of that first performance now available from VAI - was so confident and assured under the composer’s baton. It is also not surprising that Britten subsequently felt the need to revise the score, deleting the Captain’s ‘muster scene’ at the end of the original Act One - which oddly enough he had specifically requested from his librettist E.M. Forster - and making some minor adjustments elsewhere. That revised version formed the basis for Britten’s own 1968 Decca recording and for a BBC television production conducted by Charles Mackerras which has recently resurfaced on DVD. The ‘muster scene’ has subsequently been reinstated in some recordings such as those by Kent Nagano for Virgin and Donald Runnicles for Orfeo. One must nevertheless feel that Britten was right to cut it and to link the original First Act to the Second – Ernest Newman infamously complained that the scene reminded him irresistibly of Pinafore. The reason usually cited for the deletion was that the heroic nature of the scene no longer suited the voice of Peter Pears, who inevitably sang the role of Captain Vere in the BBC telecast and Decca recording. The participation of Pears had other disadvantages too. Vere is seen as an old man in the Prologue and Epilogue, narrating the incidents which form the main action of the plot. In the hands of Pears, some fifteen years after the première, Vere sounds implausibly aged throughout, and certainly older than a naval captain would conceivably have been during the era of the French Revolutionary Wars. He was also clearly not in his best voice at the time of the audio recording, and the infirmities of his portrayal are sometimes painfully evident, most notably in his laboured delivery of phrases like “the angel of God has struck”. In this new recording, taken from live performances at the Glyndebourne Festival, there are no such concerns. John Mark Ainsley sounds properly young and relatively inexperienced - the sort of man who might find himself propelled into taking decisions that a more seasoned captain might have been able to resist. He sings with great assurance and dedication, yielding nothing to Pears in his expression of anguish, misery and ultimate redemption. By his side we are given a predominantly young cast, who also fit more easily into the roles of young seamen than Britten’s more experienced and seasoned crew. In the title role Jacques Imbrailo is quite simply superlative. He has a lighter, almost tenorish, voice which portrays the handsome young foretopman more convincingly than Britten’s weightier and rougher Peter Glossop. Although at times he yields points to Glossop in sheer force of delivery, he rises well to his extended Billie in the Darbies ballad in the final Act. Indeed he sounds younger than Thomas Allen, whose Billy Budd for the Welsh National Opera was one of the great operatic experiences of my life, but who was considerably older by the time he came to record it for video with English National Opera. Britten in 1968 had a cast of sailors and officers many of whom were indeed very young at the time, and the combination of Robert Tear and Benjamin Luxon in the scene following the flogging of the Novice is beautifully poised in his hands – more so than here where Sir Mark Elder fails to achieve the same sense of loss and consolation (CD 2, track 2). Britten also had the advantage of Owen Brannigan as the old seaman Dansker, whose forceful delivery during the duet that closes the new Act One has more sense of imminent danger than we get here with Jeremy White. Otherwise the honours are very evenly matched. For the three officers Britten in 1968 had John Shirley-Quirk, Bryan Drake and David Kelly, all Aldeburgh Festival regulars who worked with Britten over a considerable number of years. It has to be said that Shirley-Quirk has rather too noble and sympathetic a voice for the basically obtuse and xenophobic Redburn, but Drake is properly rather nasty as Flint. Iain Patterson is more characterful here, although Matthew Rose as Flint is somewhat curiously given star billing on the cover of the box, which seems rather unfair on his fellow-officers. One must not fail to mention the superb Glyndebourne chorus, who produce a really hair-raising effect as they come into view singing their shanties at the beginning of the final scene of Act One; here they knock spots off Britten’s comparatively tame Ambrosian Singers (CD2, track 11). The orchestra too is superb, and under the baton of Sir Mark Elder they produce sound that is streets ahead of the sometimes tentative playing on the Britten set; better balanced too. Elder takes the notorious passage of 34 common chords which links into the Billy in the Darbies scene slightly slower than Britten, to the considerable advantage of the atmosphere, and his players deliver better nuanced sounds as well (CD 3, track 13). The real problem with this new set comes with the casting of Phillip Ens as Claggart. From the first performance this is a role that has always been cast with black basses of the Wagnerian stamp, from Frederick Dahlberg in 1951 through Michael Langdon, Forbes Robinson and Richard van Allan, all of whom brought a sense of permeating and corrupting evil to the part; Robinson the best of all, as can be heard on his recording of the monologue conducted by Solti on a long-deleted Covent Garden LP. Ens’s voice is basically just too light and baritonal, and, more seriously, lacks the sense of sheer power that enables Claggart to dominate not only the men below decks but also to put the fear of God into the officers. It appears from reviews of the original stage production that Ens was highly impressive dramatically, but in purely audio terms this Claggart simply sounds almost too sympathetic. He also seems unable clearly to define the frequent semi-tonal shifts that form an essential part of Claggart’s music – such as in the line “Let him crawl” (CD 2, end of track 1) – and indeed constitute one of Claggart’s principal leitmotifs. Time and again these phrases are rounded off unclearly, almost apologetically in a manner that recalls Eric Halfvarson who similarly smudged his lines in both the Nagano and Runnicles recordings. In the final analysis, this is a role that has more recently been undertaken by Wotans such as James Morris and John Tomlinson, and Ens simply lacks the vocal heft to match such competition. The CDs come packaged in a handsome hardback book complete with the complete text and a long and informative essay by Philip Reed. Only the synopsis is given in translation here, into French and German. The length of the new Act One means that a suitable point for a break has to be found, and like all other recordings this one follows Britten’s arrangement with the change of disc corresponding with the end of the first LP side. Oddly enough only Kent Nagano, using the longer four-Act version, manages to get the whole of the first two Acts onto one CD. Making the break just before Claggart’s I heard, your honour, makes for a very short first disc, and only the Decca reissue of the Britten recording provides a fill-up in the shape of two song-cycles. Mind you, Elder’s slower speeds make for a very lengthy third CD which pushes at the very limits of the technology. In this review I have concentrated on comparisons with Britten’s own 1968 studio recording. This remains the historical touchstone by which all subsequent issues must necessarily be judged. There have been a considerable number of new issues since then, including excellent performances conducted by Richard Hickox and Daniel Harding. Both of these latter were studio or concert recordings, and the absence of stage noises and the very occasional infelicities of balance which are found in this Glyndebourne live performance must tell in their favour. In a recent BBC Building a Library feature Piers Burton-Page selected Hickox’s Chandos issue (with three superb leading soloists) as the best modern recording currently available. Despite the many virtues of this new set that verdict may safely stand. For those who want a souvenir of the Glyndebourne production the DVD version, with the advantage of Ens’s stage presence to offset his vocal performance, will surely be the preferred option. Indeed, given the dated black-and-white picture and gritty sound of the Mackerras BBC version and the decidedly unatmospheric ENO production under David Atherton - where the orchestra also sounds rather backward - it will certainly be the best representation in that format.